Rebounding is a popular form of exercise, requiring very little space and no special equipment beyond the rebounder itself. 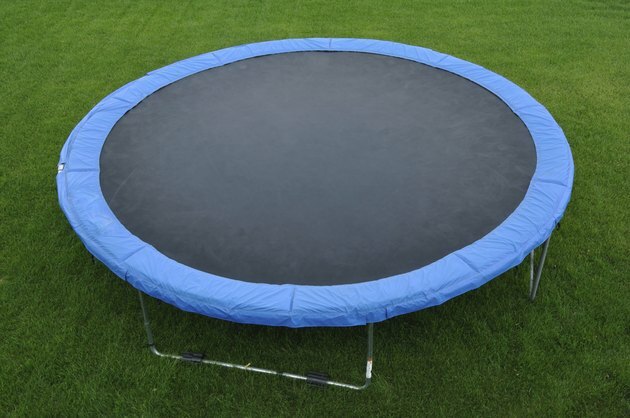 However, rebounders, also known as mini-trampolines, come in a dizzying array of styles and prices. With a little information, you can choose the best one for your budget and health needs. Rebounders and mini-trampolines are training devices that will support the full weight of your body. Don't skimp on quality in order to save money; a trip to the emergency room isn't cheap. Jim Donak, a trampoline fitness instructor from San Francisco, recommends looking for a model with a solid frame, legs that attach firmly, and a good-quality mat. The Urban Rebounder is a good option for those with limited financial resources. As of early 2011, the Urban Rebounder retailed for approximately $90. The Urban Rebounder, which comes in only one size, features a sturdy, solid-steel frame, high-quality polypropylene mat, and it conveniently folds for storage. The mat has a yellow ring around the edge, making it easy to stay positioned in the middle of the jumping area. This rebounder comes with an instruction manual, workout DVD, and stability bar for those with less-than-perfect balance. If you have a little more money to spend, consider the Cellerciser rebounder. The company offers several models, which as of early 2011 ranged in price from $ 325 to $499. These rebounders feature a more advanced spring design than the Urban Rebounder, which, according to the company website, helps provide smooth movement and reduce stress on your joints. All models have solid-steel frames, polypropylene mats, and come with stability bars; the higher-priced models fold into smaller shapes, an important consideration if space is at a premium where you live. If you're looking for the ultimate in rebounding comfort, consider the Bellicon rebounder, a product of the QiBounding company. Ranging in price from $629 to $899, Bellicon rebounders have solid steel construction and polypropylene mats; balance bars are sold separately. However, instead of squeaky springs, Bellicon uses high-quality elastic bands, which, according to the company website, are "whisper-quiet." The higher-priced models are larger, fold for storage and are made from attractive stainless steel rather than black standard steel.